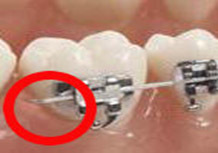 At the start of your orthodontic care, our office will advise you on how to handle most cases of broken or loose braces, as well as irritations due to your appliances. While most situations can be adequately managed until your next scheduled visit, few will require immediate professional attention. Keep in mind that loose and damaged orthodontic appliances are often the result of eating the wrong foods or harmful oral habits such as biting your nails or chewing on ice, pencils, and pens. 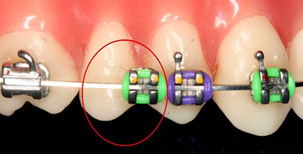 However, there are occasions when even with normal usage and good care a brace will break, a protruding wire can become irritating, or elastic accessories will dislodge. If any of this happens, please contact us as soon as possible so that we can check and repair your appliance. If the loose wire is causing irritation to your lips or cheeks, put wax or a wet cotton ball over the broken wire to relieve the pain. If any piece of your appliance comes off, be sure to save it and bring it to the office with you.